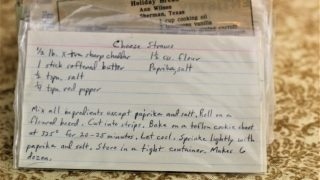 Front of the recipe card for Cheese Straws. 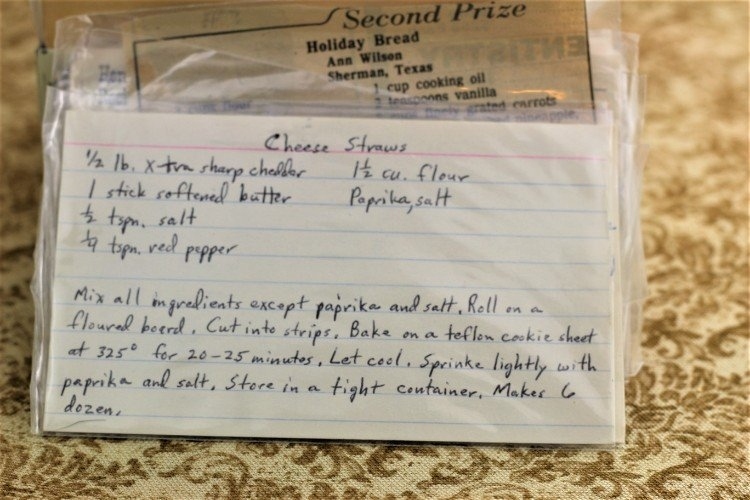 There are lots of fun recipes to read in the box this recipe for Cheese Straws was with. Use the links below to view other recipes similar to this Cheese Straws recipe. If you make this Cheese Straws recipe, please share your photos and comments below! Mix all ingredients except paprika and salt. Roll on a floured board. Cut into strips. Bake on a teflon cookie sheet at 325° for 20-25 minutes. Let cool. Sprinkle lightly with paprika and salt. Store in a tight container. Makes 6 dozen.